Starwood Preferred Guest (SPG) has relaunched the Gold & Platinum challenge for select corporate customers that can earn Gold status having nine eligible night and Platinum on eighteen over three month period. SPG has separate Gold & Platinum challenges available for those that don’t work for companies whose travelers are eligible for this offer. You can read the article about the status match here. You can access SPG Gold & Platinum challenge here. You can see if your employer’s travelers are eligible for this promotion by plugging in your work email address. If you completed Gold or Platinum challenge after February 2016, the new status will be valid until February 2018. The terms and conditions only refer to eligible stays. You can, however, credit up to three rooms each night that are under your name towards this challenge. This promotion is only available for those that haven’t had earned elite status with SPG during the last five years or participated to the status challenge previously. Those that cannot sign up for this offer can tale advantage of the status match that I wrote previously. The only difference really is that in that case you need to contact SPG to sign up for the offer while you can sign up for this one on SPG’s website. Eligibility: Members must be employed by select companies to be eligible for this promotion. Members must enter their work email address during registration in order to validate place of employment. Registration: Between January 1, 2016, and December 31, 2016 (by 11:59 p.m. Eastern Time), eligible SPG® members will have the opportunity to register for the SPG Gold or Platinum Status Challenge Promotion (the “Promotion”) at http://spg.com/statuschallenge. Non-SPG members may join SPG and register for the Promotion at http://spg.com/statuschallenge. Members must register for either the Gold Promotion or Platinum Promotion. Offer: Members must register by December 31, 2016, and choose a consecutive three-month (3-month) earning period (the “Promotional Period”) from the options provided at time of registration. For example, if a member registers in January 2016, the Promotional Period options from which to choose are: January-March 2016, February-April 2016 or March-May 2016. Platinum Promotion participants must complete 18 Eligible Paid Nights at a participating SPG hotel within their Promotional Period. Gold Promotion participants must have nine (9) Eligible Paid Nights within their Promotional Period. SPG Award Nights do not count as Eligible Paid Nights for the purpose of the Promotion. Retroactive Paid Nights will not count toward the Promotion. Only Eligible Paid Nights that occur within the chosen Promotional Period will count toward the Promotion. Eligibility: Status Challenge promotions are not available to members who have earned SPG elite-level within the five years prior to the current year. 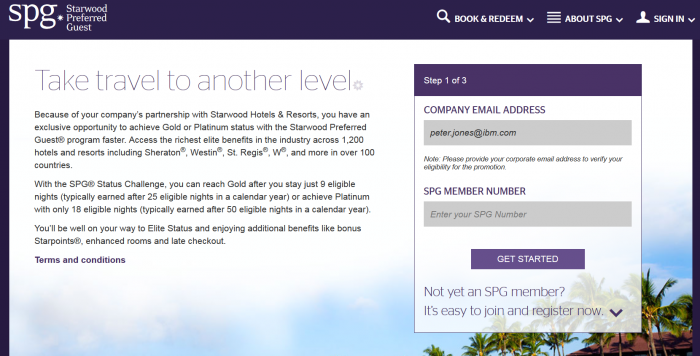 Specifically, SPG members who earned Gold or Platinum status in or after 2011 are not eligible for the Gold Status Challenge offer, and SPG Members who earned Platinum in or after 2011 are not eligible for the Platinum Status Challenge offer. Members who have successfully completed any prior SPG status challenge promotions may not register for this Promotion. Members may register and attempt to participate in the Promotion again if they fail to complete the Promotion. If a member completes the Gold Promotion and is successful, he or she is able to come back to register for the Platinum Promotion. Members may not, however, repeat a Promotion that they have already successfully completed. Earning: Members who meet all terms and conditions and successfully complete the Gold Promotion will be upgraded to Gold status. Upgrade to Gold status will occur within 5-7 days of the stay posting to the member’s account with the ninth (9th) Eligible Paid Night completed. Members who meet all terms and conditions and successfully complete the Platinum Promotion will be upgraded to Platinum status. Upgrade to Platinum status will occur within 5-7 days of the stay posting to the member’s account with the 18th Eligible Paid Night completed. Once an SPG member reaches elite membership status, the applicable benefits will commence during the member’s Promotional Period. Since this is a promotion, the month the elite status is earned in will determine the duration of the status. If member earns Gold or Platinum status in January or February 2016, he/she will maintain that status through February 28, 2017. If member earns Gold or Platinum status in March through December 2016, he/she will maintain that status through February 28, 2018. Starwood Terms: Starwood is not responsible for omissions or typographical errors. Starwood reserves the right to modify, change or terminate any of the terms and conditions of the Promotion in its entirety at any time, without notice. An Eligible Paid Night is a night at any of the more than 1,200 SPG-participating hotels and resorts paying an Eligible Rate during the Promotional Period. Nights do not have to be consecutive and can be accumulated across multiple stays. An Eligible Rate is any rate that is eligible to earn Starpoints® in the Starwood Preferred Guest® program. SPG-participating hotels and resorts and a description of Eligible Stays and Eligible Rates can be found at spg.com under Terms & Conditions of the SPG Program. Eligible Paid Nights do not include those nights reserved through a third-party online agency, such as Expedia, Priceline, Hotwire, etc. Please see Terms & Conditions of the SPG Program for more information on what qualifies as an Eligible Night. Void where prohibited. Previous articleVirgin America Up For Sale!